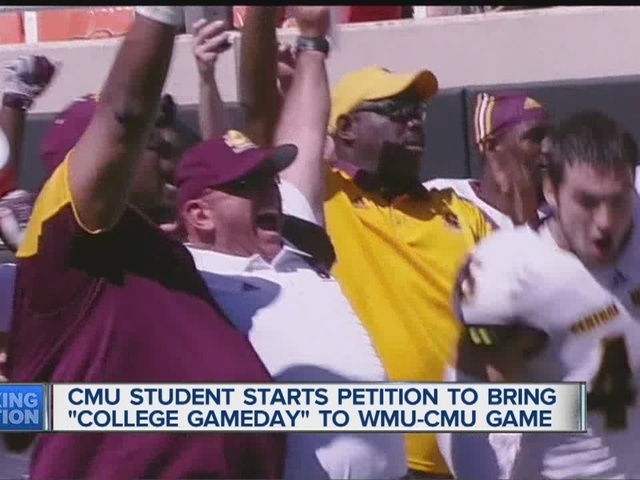 MOUNT PLEASANT, Mich. (WXYZ) -- A Central Michigan University student has launched a campaign to bring ESPN's "College GameDay" to Mount Pleasant for the Chippewas' rivalry matchup with Western Michigan on October 1. CMU junior Joshua Scanlin launched an online petition that, as of 11:00 p.m. Tuesday, has over 1,100 signatures. "College GameDay" last visited a Mid-American Conference game in 2003, a top-25 battle between Northern Illinois and Bowling Green. CMU and WMU are both out to 3-0 starts in 2016, and have each beaten opponents from Power Five conferences: the Chippewas upsetting No. 22 Oklahoma State on September 10, and the Broncos beating Northwestern and Illinois on September 3 and 17, respectively. Even if ESPN opts to take "GameDay" elsewhere, the game itself will receive national attention, as CBS Sports Network will televise the "Battle for the Victory Cannon" in primetime.